Industrial Newsboy Bicycle. The most popular industrial bicycle in North America. Classically designed with "cantilever" style 18" frame with dual top bars. Fully lugged, hand brazed utilizing 1" 16 gauge frame tubing with 5/8" rear frame stays. Our New York based factory workers weld each frame carefully and with great pride, as do our painters and assemblers. We take great pride building each cycle right here in the USA. Features include Exclusive Worksman Clincher Rims, 11 gauge spokes (.120- thickest spokes used on any bicycle) and much more. Shown with optional Baskets. These Bikes are not toys..these are authentic Worksman Industrial Bicycles.Remember, choose Worksman because you want the best industrial bicycles on earth, with components that are more heavy duty than any other bicycles. Don't buy a toy, but rather a true Worksman Industrial Bike. There is a huge difference. Worksman Industrial Bikes are proudly made in our Solar Powered New York City (Ozone Park) factory. 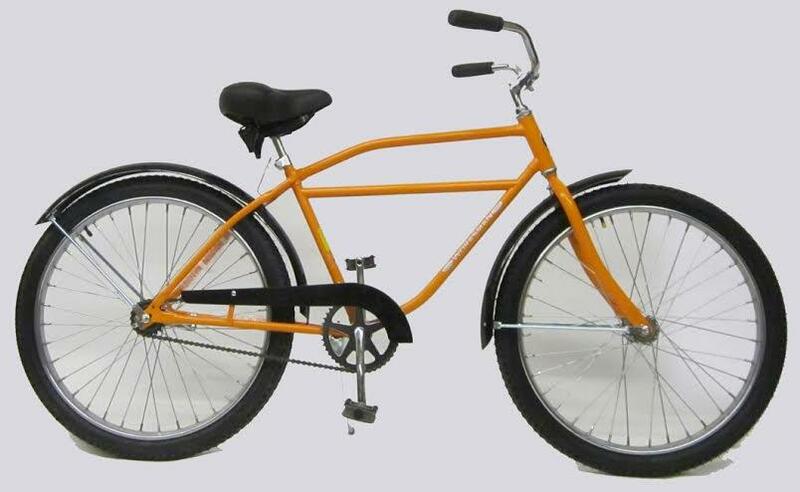 The perfect bicycle for the Jersey shore. All in classic blazing orange. The best bicycle we have ever owned. This bike fits our needs within the plant, it also allows us a way to move around in areas where anything that can produce sparks such as golf carts cannot go.